Check out all the places to eat on Galveston Island. There is sure to be something for everyone, no matter what type of cuisine is your favorite. Check out some of the American restaurants on Galveston Island. Check out some of the Asian restaurants on Galveston Island. Check out some of the Italian restaurants on Galveston Island. Check out some of the Mexican restaurants on Galveston Island. Check out some of the seafood restaurants on Galveston Island. Time for dessert??? 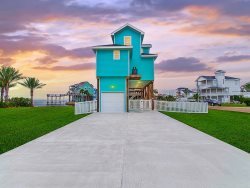 Galveston offers plenty of options! Check out some of the taverns that serve food on Galveston Island. Check out some of the restaurants right here on the West End of Galveston Island. Check out some of the restaurants that deliver to the West End of Galveston Island. Please notice, most restaurants only deliver to a portion of the West End.